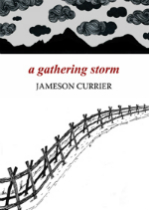 A Gathering Storm by Jameson Currier is the story of a hate crime. In a small, unnamed university town in the American South, on a Monday night in September, a gay college student named Danny meets two other men in a local bar; after they leave, they drive Danny to a remote spot, beat him, tie him to a fence, and leave him to die. Once he is discovered—after suffering exposure outdoors overnight—and taken to a local hospital, word of the hate crime spreads, and the residents of the town and university suddenly find themselves at the center of a media frenzy, as the news quickly reverberates beyond the local community. The novel begins with the actual committing of the hate crime, and then it intertwines two different stories: the first is the effects of the crime on the people of the community over the course of the following week, and the second retells the events of Danny’s last day alive. So, as we read Currier’s novel, we simultaneously learn Danny’s story and also see how Danny’s story changes over the course of the week: we witness the myth making of the community, news media, and outsiders as they come to grips with the tragedy, and/or use it to further their own agendas. Currier notes in his introduction that the novel was initially inspired by the events of Matthew Shepard’s slaying in Laramie, WY, in October 1998, and further informed by subsequent hate crimes committed against gay men, but his novel should not be viewed as merely a dry or sensational retelling of these crimes. In the unfolding of the subsequent events, Currier includes the individual stories of Danny’s family, Danny’s friends, the perpetrators, fellow university students, even people who had never met Danny but are still affected by the crime: exactly the kind of details that seldom make it into news reports or talk show sound bites. Currier’s approach allows us to learn not only the immediate effects of the crime on the community, but also the dormant seeds that led to the crime in the first place. Moreover, as often happens when a crime of this magnitude is committed in a small, close-knit community, the social fabric begins to unravel and the dark secrets lurking behind the congenial facade of small-town life begin to surface. The novel was first drafted over a decade ago, and we can see the impact of technology, especially the dizzying speed whereby news of the hate crime spreads first throughout the town and university, and from there across the country. But if the novel were written now, that speed would be positively blinding, as we would no doubt see the effects of social media: #universitystudentdanny or #hatecrimevictim would likely be trending on Twitter, or videos of the mutilated body might be posted online, taken by the bikers who discovered Danny, to become viral. One wonders if the result would be the compression of a week’s worth of events into a couple of days, followed by the blinding speed whereby the event then disappears from the local and national consciousness. Currier’s novel is a grim one, but it is not purely a story of human cruelty. Currier weaves throughout strands of outrage, courage, uncertainty, denial, doubt—all typical human responses to tragedy. Currier’s focus on individual stories also underscores that change begins at the individual level before it can happen to a group. The positive change that occurs as a result of the tragedy starts with individual people, and initially is small in scope, but results in larger changes near novel’s end, thus justifying the novel’s end on a note of hope. Keith Glaeske is a medievalist and collector of speculative fiction currently living in Washington, DC. His articles about medieval literature have been published in Medieval Perspectives, Traditio, and Ériu.